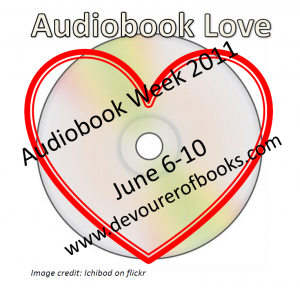 Jen from Devourer of Books has proclaimed June 6- 10 Audiobook Week to celebrate books we listen to rather than read. Last year, I was fairly new to audiobooks having only listened to a couple of CDs I borrowed from the library and some podcasts from itunes. I wasn't a fan of the CDs since it took time to upload the CDs to my ipod and I'm sure the last patron used the discs as coasters- they were filthy. I loved the podcasts but I was running out of new material when something happened at my local library- they got Overdrive. I became an audiobook junkie. I've downloaded over a dozen library audiobooks since the service became available. I've listened to Catching Fire, Dead Tossed Waves, This Book Is Overdue, Married With Zombies, Eat Pray Love and many more. An audiobook even made reading my nemesis Henry James possible. I don't think I could have enjoyed The Turn of the Screw otherwise. It's so easy to get books from the library this way; I don't even have to leave the house and it takes minutes to get them on my ipod. Over the last year I started submitting my reviews to Audiobook Jukebox a great resource for audiobook reviews. If you haven't checked out the site, please do. I love being able to listen to a story while doing housework, folding the laundry, taking a run. I do enjoy listening to music while doing those things but sometimes I need a book. It's funny, when people mention a book, I'll remember what I was doing when I was listening to it. "Oh yeah, I was scrubbing the floor during that one." Ha! Maybe that's a little strange but hey that's my life! And since today is cleaning day, you know I have an audiobook all ready to go. My library got Overdrive recently. I've used it mostly for e-books so far, but I did download ROOM on audio. While I didn't finish it, I looooove the ease of borrowing audiobooks!!! I will definitely listen to more. I'm still a newbie when it comes to listening to audio books. So far, I only get them from the library - but now I am going to see if my library has overdrive! My intro post can be found here. How do I ALWAYS forget about Overdrive? I need to be better at check if books I'm interested in are available there. Surprisingly, I have not looked into audios at the library yet. I'm adding this to my to do list as we speak. I also love audiobooks. They make chores and exercising so much easier. I've been enjoying quite a few classics on audio... may not have made it all the way through Bleak House any other way! Audio books certainly do make chores more tolerable! I've used Overdrive for ebooks through my library, but never for audiobooks. Thanks for pointing that out - I need to go take a look at what the NYPL has to offer! I love Overdrive! It's the best thing to happen to my library in years! I use it to check out audio and ebooks. I haven't listened to Eat, Pray, Love on audio but I did listen to Gilbert's Committed which I enjoyed. I love Overdrive, too - just wish my library was quicker about adding recent releases. Andi- It's so easy! Much easier than CDs. Kristin- Good luck! It was a nice surprise when the library got Overdrive. 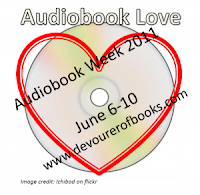 Jen- Thanks for hosting Audiobook Week! Heather- Yes, there are a lot of WMA books on there. I have to convert them to get them on the ipod. Kenpen & Kathy- Yes, they do! JoAnn- Bleak House would have been a good one to listen to. Molly- I've never borrowed ebooks yet. One of these days. Vasilly- I agree, I love that my library uses it. Carrie- Yes, I'm constantly checking to see if there's anything new. I think my library has Overdrive, methinks I should check that out. My library has Overdrive too! It is wonderful. my library has Overdrive, but i don't seem to be able to get it to work properly on my iPod shuffle for some reason. i always seem to get the chapters jumbled up and get too discouraged to keep going. i'm going to try again on my iPad now that i have it and see if that helps. i'd never heard of Audiobook Jukebox before. thanks for the heads up!